Delegates to the campaign launch also prayed for a peaceful and violent free elections in May. 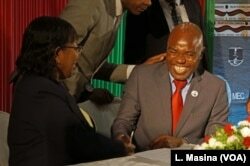 Opposition Malawi Congress Party General Secretary, Eisenhower Mkaka, cracks jokes with MEC chairperson Jane Ansah as he signed a code of conduct,Tuesday in Lilongwe. 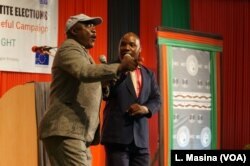 The ceremony was also spiced up by comedians who sensitized the audience on the need of peaceful elections. Ending government corruption is expected to dominate Malawi’s election. 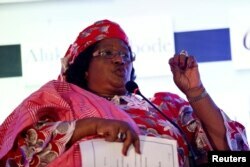 FILE - Former President of Malawi Joyce Banda speaks during a conference on women in development programme in Lagos, Nigeria, July 28, 2016.